Angela Merkel’s visit to Japan only lasted 25 hours. Still, the Chancellor took time to meet with German learners at the Goethe-Institut Tokyo. Their conversation mainly focused on the methods of language acquisition. Angela Merkel visited Japan from 4 February 2019 for exactly 25 hours. Her agenda included meetings with Prime Minister Abe, Emperor Akihito and Crown Prince Naruhito. Her time was also dedicated to culture and science. The Chancellor spoke not only with Keio University students and Japanese scientists, but also with eight participants in the language courses at the Goethe-Institut Tokyo. The meeting took place in the residence of the German Embassy in Tokyo. Peter Anders, the director of the Goethe-Institut Tokyo, and Matthias von Gehlen, the head of the language department, welcomed Angela Merkel, who, after an introduction by the Ambassador, Dr Hans Carl von Werthern, started her conversation with the group. The German skills of the eight Japanese guests who had been invited were quite advanced, so the Chancellor asked in particular about the type and extent of German lessons at the Goethe-Institut Tokyo. 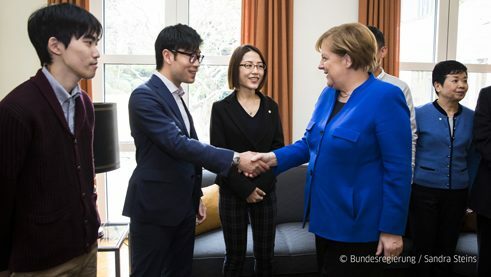 In addition, the Chancellor was informed about the German learners who would like to participate in the volunteer programme for the Olympic Games 2020 in Tokyo. The Goethe-Institut Tokyo is helping the Olympic Committee in its search for volunteers with language skills that suit interpreting jobs. Part of this activity is the language course Explain Japan in German, which is also attended by some of the guests of the meeting. Following the meeting, the Federal Chancellor turned to another focus of her trip: Japan's pathway to “Society 5.0.” The Goethe-Institut Tokyo is also taking up this development and would like to strengthen the digital skills of German learners during their language acquisition, for example with the pilot course My Avatar Speaks German, which will soon be starting. The use of various apps offers the students the opportunity to practice everyday situations playfully with the help of self-designed avatars. Working with the app technologies is part of the programme.